PetGiftBox - July 2015 + Coupon Code! 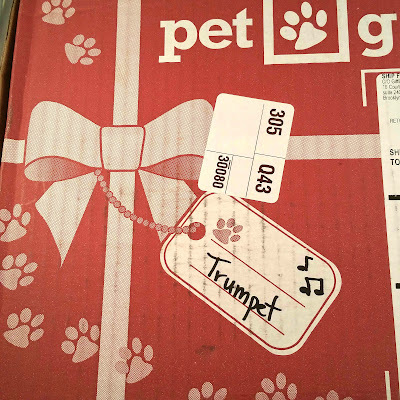 The lovely people at Pet Gift Box sent me (Trumpet) another box for me (him) to review! I wasn't able to get a good picture of him with his toys, though, thanks to him being wild all day! I am hosting a giveaway that will run from right now to the 15th, so read through to enter the giveaway! 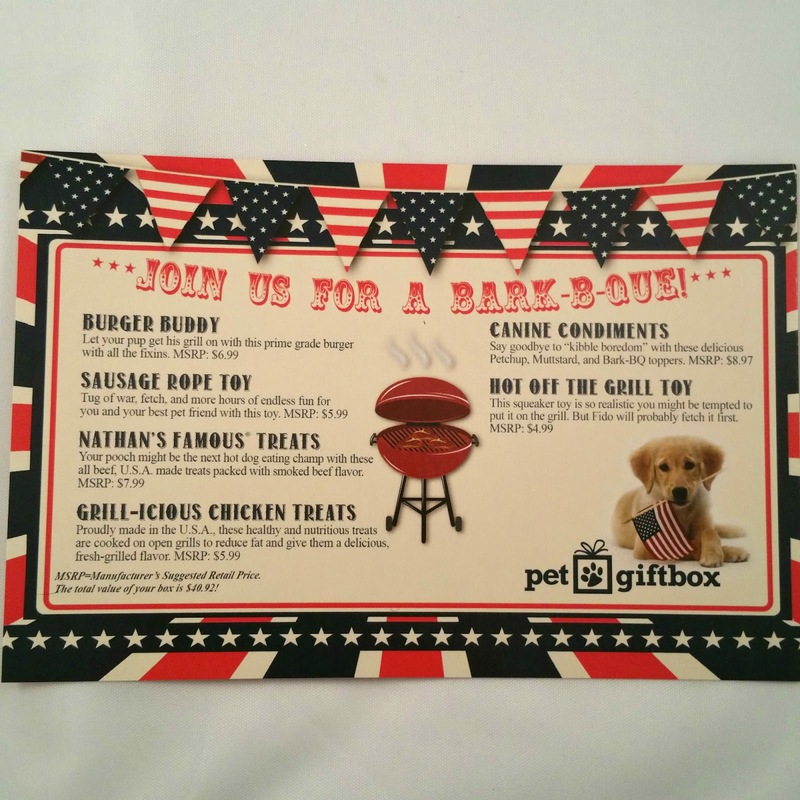 What is PetGiftBox? 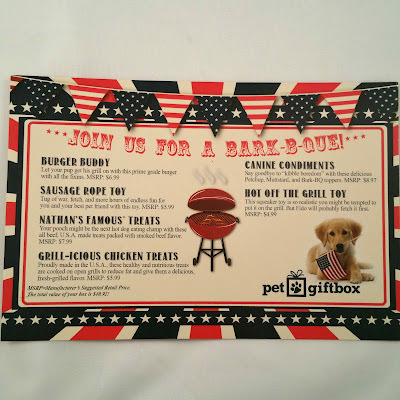 : Pet Gift Box is a monthly pet subscription box, with the option of dogs or cats! For dogs, there's three options for size and you tell them the name and gender of your pet, regardless of cat or dog. How Much is Pet Gift Box? : Pet Gift Box is $27.99/month and gets cheaper with longer subscriptions. Get 25% off with code rambling! 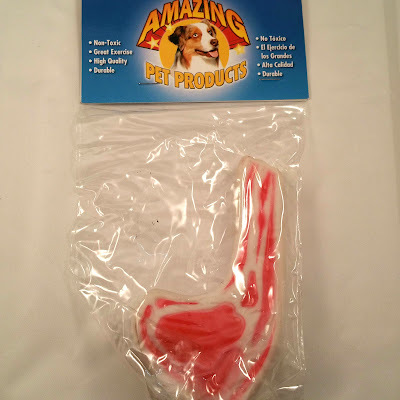 See more Pet Gift Box reviews here! I just love how the box is customized! Burger Buddy ($6.99) - This is such a cute toy. It had plastic to make it 'crinkle' and had a squeaker, and lasted like 20 minutes. It's great for dogs that aren't huge chewers, thanks to it having so many components to it. Trumpet, however, is a huge chewer and destroys toys in no time. 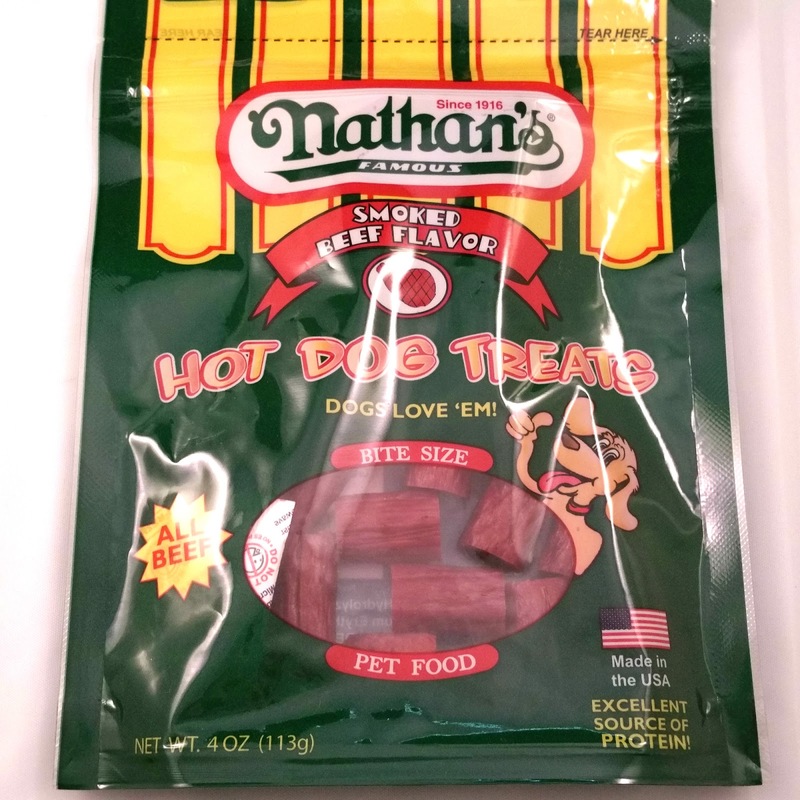 Nathan's Famous Treats ($7.99) - According to husband, these smell just like Slim Jims. Trumpet loves them and thinks he deserves more than one when he gets one. These are all-beef, which makes me less concerned if he does get two sometimes. Grill-icious Chicken Treats ($5.99) - They're little hamburgers, but made with chicken and sweet potatoes. They are pretty hard, so I break them up for Trumpet, so he doesn't have to fight with chewing. They're not really smelly, like dog treats can be, which I love! 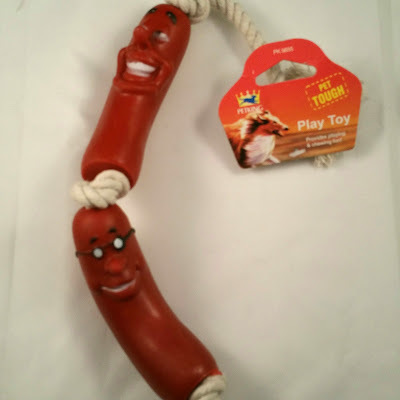 Sausage Rope Toy ($5.99) - This poor little sausage toy lasted less than ten minutes. I love when toys have different parts to them, and it probably would have lasted much longer with any other dog. 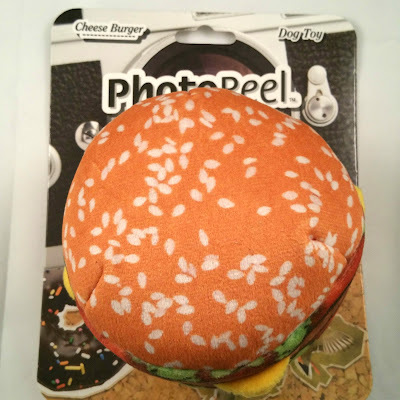 Hot Off the Grill Toy ($4.99) - This toy took the award for lasting the least amount of time, less than five minutes. It was really cute at first because Trumpet couldn't figure out the squeaker, and then he just flat out destroyed it. 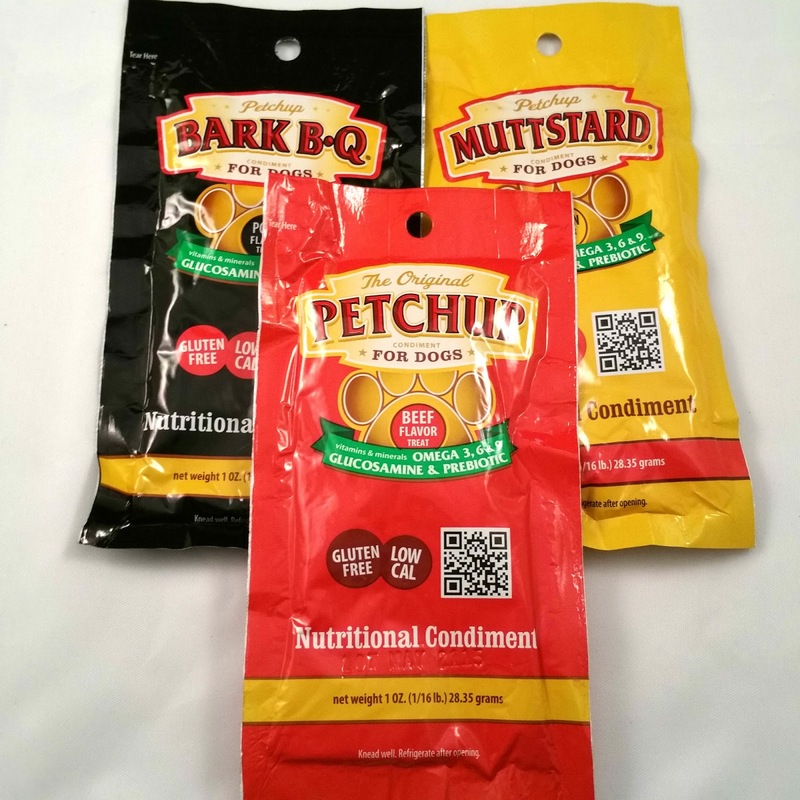 Canine Condiments ($8.97) - I really never knew you could buy condiments for dogs before this, but it's cute and can be used if your dog doesn't like his food. They also have nutritional values, so it's not the same as putting junk on their food. 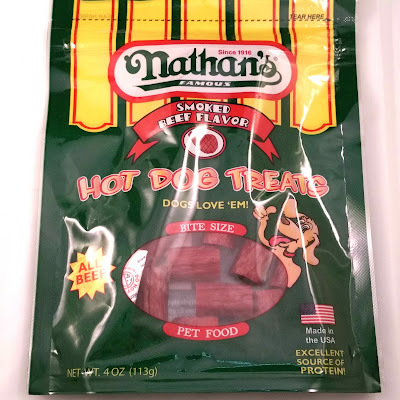 If/when we switch out Trumpet's food, I'll try these out on his food. If we decide not to for a little while, I'm just going to add it for something special! This month's box is valued at $40.92, which is great for how much it costs! I loved that they featured a lot of toys this month, and most dogs that aren't big chewers would have gotten a ton of time out of these toys. 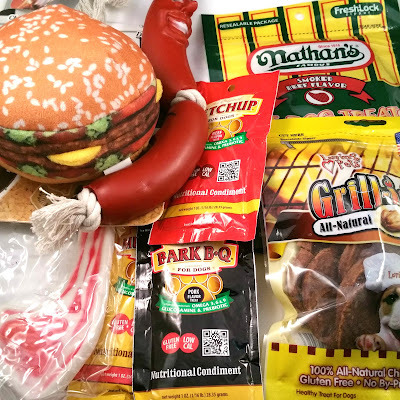 The treats are amazing and I was definitely introduced to something new, with the condiments. 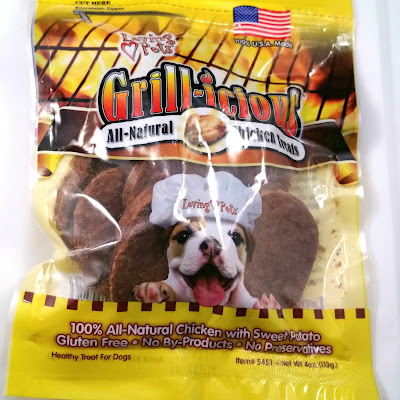 Like I said before, I am hosting a giveaway for a Pet Gift Box for dogs. If you're mobile, click the Rafflecopter link below! Disclosure: This box was sent to me in exchange for a review. This box looks sooo cute! This is the cutest box ever! Never tried this..looks good! Thanks for this cute giveaway! Have you ever tried Bark Box? Do the two compare to you?